Emily is an Applied Research Analyst at the Center for High Impact Philanthropy (CHIP), focusing on the Mental Health & Addiction and Strengthening Democracy projects. 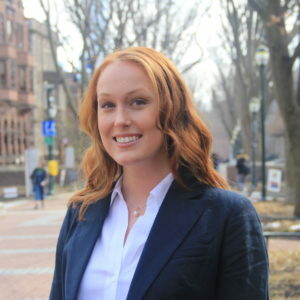 Prior to joining the Center, Emily worked as a Research Analyst with Center City District, the Business Improvement District for downtown Philadelphia. At Center City District, she focused on issues related to tax policy, housing and commercial development, transportation, and local economic growth. Emily received her BS in Sociology from Saint Joseph’s University. She is a member of Back on My Feet Philadelphia’s Young Leaders Association, as well as a board member of Philly Set Go, a locally-focused PAC targeting issues affecting millennial voters.